Shame on The View, I think this show tends to focus mostly on negativity. I have yet to see anything positive from the clips that I have seen from The View but I am also not an avid viewer of The View to be completely honest. It is not only the view but rather most of the mainstream media. I feel that we are in a time in this country when the media is overtly trying to create racial tensions just because we went from a president who was black and was a great speaker to a president who is white and doesn’t bite his tongue. The propaganda is coming form both parties, not just the leftists. Ever hear of the Sinclair Broadcast Group? Well, reporters have been reading scripts off of prompters before this was ever brought to light. It is just another instance of the propaganda machine. We, as people regardless of race, need to come together and focus more on positivity today. I understand that there are bad things happening out there in the world because the world is not perfect. Some racism still exists out there but I feel there was a really large shift in the amount of negativity and racial tensions due to the current president coming into office. I personally have never been a guy who was big into politics but I do feel that politics can be a very touchy subject because people get very passionate about what they believe. It is fine to be passionate about what you believe but you should also keep an open mind and realize that others may not see eye to eye and that is ok. When people stick to one political party it is like joining a gang, so to speak. people often times tend to choose one party and completely ignore the opinions of anyone who thinks otherwise. 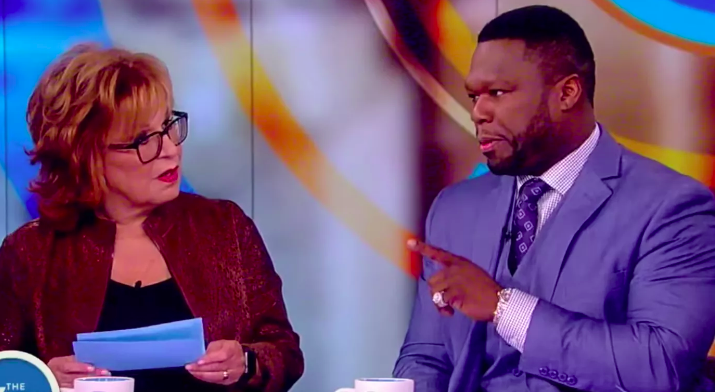 In this clip of 50 Cent on the View, they try to race bait him with questions about how certain white people have called the cops on black folks for things that do not deserve the cops to be called. The way they make it sound is that all white people think this way which is just totally untrue. 50 Cent, being the smart individual that he is, doesn’t get caught up in this trap. His response was very brilliant in fact, and part of the reason why I am a huge 50 Cent fan. His reaction to the question is that this is a certain group that would call the cops on anyone. Joy Behar did not appreciate the response because she was anticipating for him to fall right into her little trap and help perpetuate the negativity that The View is known to spew. Sorry Joy, not this time. The main point of this whole article, or the moral of the story, is that you have to think for yourself. Don’t get caught up in the hype, when you get information, try to really think about it before having an opinion one way or the other. Try to understand the sources of the information and determine whether or not there is an underlying agenda of this source or if they are genuinely stating facts without bias.